I love the flavor of this broth. It is a combo of the turmeric and the white pepper. 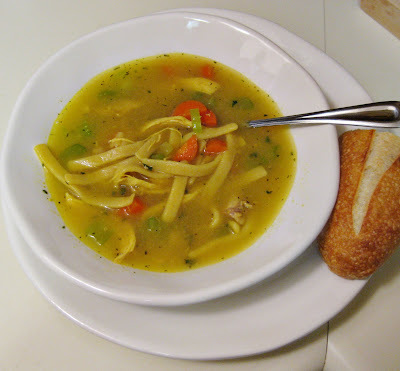 I have made homemade chicken noodle soup on several occasions and never been that impressed. The flavors in this soup are so good. Although, I think the soup would be much better if it sat for a few hours on low after all the steps below. I just don't think the noodles had enough time to fully appreciate the broth as much as I did. Again, the broth was SO SO good. 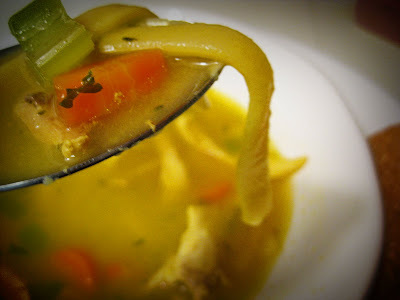 Oh yes, and the (Soup) in the title is because Pioneer Woman's recipe is for Chicken and Noodles. She adds a flour and water at the end to thicken it to the point where it is very chicken and noodley. I wanted more of a soup so I didn't thicken it as much. Either way, I am sure it is just as good. This is probably not a good week day meal because it takes some time, but I still went for it...we ate the 8:45 pm. Lots of visits by Copper and Scot to the kitchen to see how it was going. I always find myself trying to make weekend meals on weekdays. It's ok. It was worth it. BTW, these frozen egg noodles are totally a dream come true. I have been struggling to find a good egg noodle that holds up when cooked in a soup. These are perfect. Fat. Noodles. You need to eat this with crusty bread and butter. I am just not sure if there is anything better. Increase heat and add frozen egg noodles and chicken. Cook for 8 to 10 minutes. Mix flour and a little water. Stir until smooth. Pour into soup, stir to combine, and simmer for another 5 minutes, or until broth thickens a bit. Test and adjust seasonings as needed. As a guy, this is my dad's recipe, almost to a T. He does set his on low heat for about an extra hour, sometimes 2. If you do that, just make sure you stir it fairly frequently.